This blog is the record of Bill and Mary Pier’s 18 month mission to the Jakarta, Indonesia mission for The Church of Jesus Christ of Latter-day Saints. It has grown to include our missions to South Africa, Durban and Florida, Fort Lauderdale , and South Africa, Johannesburg Missions. Hopefully there will be at least one after this one…but as usual that is up to the Lord. We like this picture because it shows a little slice of two of our missions. 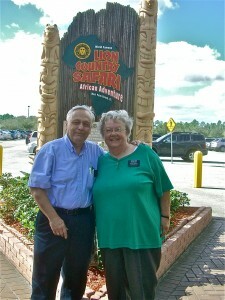 Unfortunately the Safari in Florida does not hold an candle to the ones we went on in Africa. My son just arrived in the Florida Fort Lauderdale mission a few weeks ago. Elder Low is currently serving in the Miami Beach zone, Spanish speaking with Elder Welch as his trainer. I asked my son about his apartment in our email today and he mentioned that his apartment is ok and he is getting used to the cockroaches, spiders and mice in the apartment. I asked my friend that just got home from the Malawi mission in Africa if they ever exterminate the missionaries apartments and she said that they did all of the time in Africa so they should in Florida too. I am assuming that it may be up to the missionaries to report the bug problem so I don’t want to be an interfering mother nor do I want to bother the mission president as I know that he has a lot on his plate with his heavy calling. I am looking for some advice. Sister Low…you are correct it is the missionary’s responsibility to report those problems. I know the housing coordinator very well and he would take care of it immediately if the missionary would let him know. In the 18 months we served there I never remember an apartment that had all three problems at once. Suggest to your son that he lets elder Collins know about this. I hope everything is going well. I still go to your blog weekly, eagerly awaiting any information on the Fort Lauderdale Mission. Elder Pond will return on January 30th. I am in the process of filling out college applications for him. I was wondering, if you would write a letter of recommendation for him. He would really appreciate! You can just send it to my email above. Thanks again, for your blog and all that you do! Our son Elder Park arrived in the Fort Lauderdale mission towards the end of September. He is in the Spanish speaking mission. We found your blog, and it appears you left the Fort Lauderdale mission about that same time. We are trying to learn more about the mission and were wondering if you could recommend any of the missionaries that are keeping blogs of their experience. Our son writes us a letter every week, but we feel we are missing some of the experience and would love to hear from others. Sister Park…We left the FFLM in late April but we have been keeping up this blog with excerpts from President Anderson’s letters. I hope that elder Park forwards the complete letters to you. As you notice there are a number of missionary blogs on the main page. Unfortunately most of the missionaries we know who keep blogs are either now home or will be by the end of January. BTW thank you for you keeping a blog for your elder…we know it helps other mothers to read anything they can about the mission.